It’s usually a bad idea to vent pet peeves in a blog, but I’m going to do it anyway. My complaint is about the persistent use of “The Anthropology of X” in the title of books and articles. Feel free to insert the X of your choice: disability, food, work, policing, lowriders, cell phones, rock videos, lawn care . . . This usage is arguably the laziest intellectual move in our profession and one of the reasons why I sometimes despair for the future of anthropology, a discipline that needs all the help it can get at a political moment increasingly hostile to what we do and how we do it. This regrettable disciplinary tic has a long history, going back at least to the mid-nineteenth century. The early use of the term made sense because it was usually applied to places, as in “On the Comparative Anthropology of Scotland” (1865, a paper authored by Hector Maclean). This is forgivable because the discipline was still in its infancy, and the author needed to communicate the fact that new methods were being deployed to shed light on the history and culture of a particular region. And therein lies the problem. Most general readers—and, I suspect, many academic readers as well—couldn’t care less about a writer’s disciplinary affiliation. They care far more about whether the author brings a fresh, insightful perspective to an important topic. Alas, this isn’t conveyed at all by “The anthropology of X” except in the increasingly rare case when the topic under consideration has never before been explored by an anthropologist, as in The Anthropology of Puff Pastry. For all I know, an anthropologist has already written about that, too. 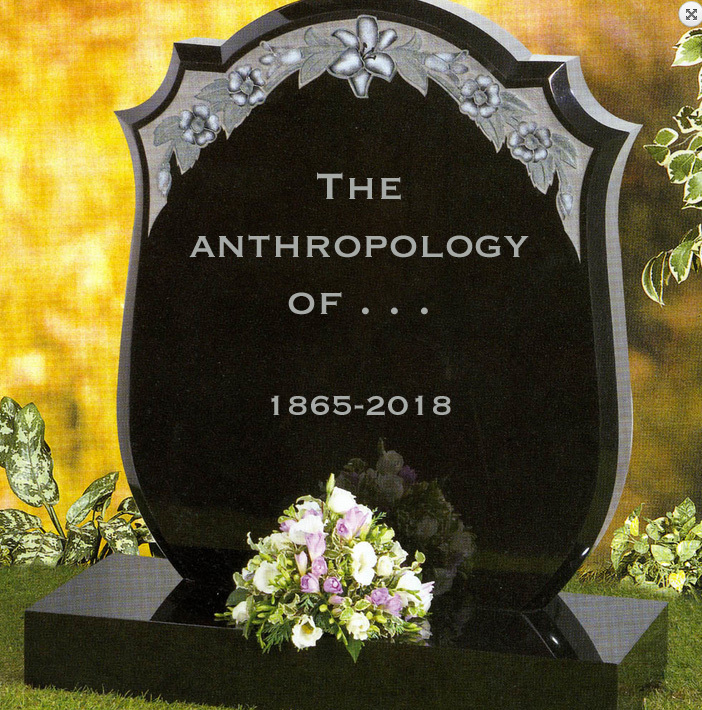 I came to this distaste for “The Anthropology of” during three and a half decades of collaborating with sociologists in a joint undergraduate department whose relations were mostly cordial and creative, largely because both wings were committed to ethnographic methods. Although we maintained two separate majors, for administrative as well as intellectual reasons we decided to downplay the disciplinary divide except in a handful of courses—e.g., SOC 101 Invitation to Sociology. So a course that at other colleges and universities might be called “Medical Anthropology” became “Illness & Healing in Comparative Perspective.” A course that could be labeled “The Sociology of Consumer Society” became “Culture, Consumption, & Modernity.” This liberated faculty and students from disciplinary constraints while encouraging everyone to focus on a range of analytical approaches relevant to the issues. Ironically, this downplaying of disciplinary boundaries made our majors more rather than less attractive to graduate programs in those cases when students decided to pursue advanced degrees. After all, doctoral programs generally do a good job of refashioning students into anthropologists, sociologists, etc. But at the admissions stage, they want broadly educated applicants with demonstrated skills in thinking, writing, and research methods. The most creative writers in anthropology avoid the “Anthropology of” meme, especially if they want their books to be widely read. Sahlins and Graeber could have titled their recent book The Anthropology of Kingship, but they wisely settled for On Kings. Tanya Luhrmann could have called her much-praised 2012 ethnography The Anthropology of Evangelical Prayer (yawn!) rather than When God Talks Back—although I’m confident that her editor at Vintage would have nixed the “Anthropology of” title in a nanosecond. What’s at stake isn’t just titles, although they matter. It’s making the effort to broaden one’s audience and write in a way that reaches them. When writing for a journal with a narrowly disciplinary audience, “The anthropology of” is fairly harmless even if it flirts with cliché. For work that aspires to broader impact, however, it qualifies as a missed opportunity. Let’s lay it to rest in a remote cemetery devoted to expired memes.